On Nov. 9, 2016, our country awoke on the precipice of a new beginning. The recent presidential election was historic in many ways, but one that particularly struck me was the unprecedented lack of enthusiasm shown by voters toward both candidates. This lack of enthusiasm reflects the hopelessness many people in the United States feel toward the actions of our government, a feeling that is also pervasive throughout the medical profession. As physicians, the idea that we are unable to affect change can prohibit us from taking action on the issues that feed into our everyday struggles in the medical profession, but this election should serve to remind us that it is our duty to our profession, and our patients, to be more involved in advocacy and policymaking moving forward. Early in my college career, I waffled between becoming either a doctor or a lawyer, and in the end, I chose medicine because I felt that it offered the opportunity for me to help the most people. That decision is one that I am thankful for every day, but somewhere along the path to becoming a physician, the part of me that was interested in advocacy and creating laws that enable us to better function as a society became dormant. I was very happy studying medicine, and from where I stood, it seemed like too much of a headache to get involved in policy. I noticed how slow things move in government, and it felt that the only way to make an impact was to immerse oneself completely in that world, rather than participate on the periphery. With the beginning of my clinical rotations last year, however, my dormant interest in advocacy started to wake up. The struggles I endured alongside my colleagues — navigating insurance laws set by people who had never interacted with a patient, the challenge of working with an outdated and inefficient electronic medical record system, and the sadness of working with patients whose medical needs could not be fulfilled because of our country’s health care laws — all highlighted for me the serious lack of advocacy by physicians for policies that directly influence our ability to perform our jobs. There are, of course, many physicians and medical organizations that play a large role in lobbying and influencing policy, but their numbers are small compared to the overall population of physicians in this country. This is reflected in the fact that whenever politicians speak about the Affordable Care Act or abortion laws, they only discuss aspects related to insurance companies or religious beliefs, rather than those pertaining to health care providers themselves. This is reflected in the fact that as health care professionals, we struggle every day against so many of the policies that dictate our ability to perform our jobs — all while quietly complaining among ourselves — but in many instances, we fail to address those complaints in a broader political context. Our world will change drastically in the next four years, and as physicians, we need to do more. It is no longer sufficient to assume that policy will address our needs as physicians and as advocates for our patients. It will be important to get involved in whatever way possible, from on-the-ground efforts to help people obtain health insurance, to making our opinions known on health care issues through writing, to talking to our congressional representatives on Capitol Hill about issues that we care about. 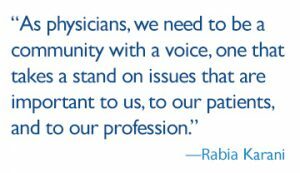 As physicians, we need to be a community with a voice, one that takes a stand on issues that are important to us, to our patients and to our profession. Read one resident's account of the complicated world of client advocacy. The Johns Hopkins University student group Medical and Educational Perspectives (MEP) is raising public awareness surrounding medical and public health issues facing the Baltimore community. One Comment on "Making Our Voices Heard in a New America"